I saw your column in Sport Diver magazine and wondered if you could help or advise me as I am at the end of my tether. I would like to get a 'Fit to Dive' certificate from my GP, who has some experience of diving. I have a number of dive trips planned over the next 12 months, at least two of which will be abroad and thought that having a certificate would be useful (and it's years since I had any sort of medical, so it would be a useful 'MOT' too). I was wondering what sort of format would be needed for the certificate to be valid pretty much anywhere - will a 'I certify ... fit to dive' be enough? Should I take the PADI info sheet along? Here's what to do. If you are fit and well, and ticked NO to all the medical questions, then all you need is a basic PADI Fit to Dive medical. Your GP can do this, but shop around as some docs charge £40, and some up to £120 for what is a basic easy to do medical. There will be a heart, lung, ear and urine check. That should suffice. However if you have ticked any YES'es then it's best to see a recognised dive doc. They will work out whether you are fit or not, and sign you off on the PADI form. Things change a bit if you are planning on diving in Australia. Best to get the form AS4005.1 done before you go, if you have a YES ticked as this can save you blood sweat and tears as you run around Cairns finding an Okker Doc to pass you as fit as your live aboard chugs off into the distance. If you are a BSAC diver, there is a different form. You can get that off their website [as you can the PADI too]. The medical is the same, but bring your own form if you see a normal GP as the chance of them having one is as likely as getting an appointment in 2 weeks. I am due to fly out to the Maldives in six weeks time and want to have a medical before I go but am unsure of which type I would need. On a recent visit to my GP for a check on my high blood pressure for which I am prescribed Losartan Potassium 50mg daily and has been controlled for over three years now because of my family history (my brother had a heart attack two months ago ) my GP believes I may now have slight angina as I mentioned. I had been getting pains in my chest and has arranged for an ECG and blood tests to be done, but suggests I have an exercise ECG done as well which I may have to wait months for at my NHS hospital. My GP knows nothing about diving and agrees a diving medical may be a good idea. Hence my request which type of medical would be best as I need to know quickly whether it is safe to dive and to still go on my holiday considering the long flight. My GP has prescribed in the meantime a 400 micrograms glyceryl trinitrate spray to use if I get any pain and lipitor 10mg tablets (until the test results are known) as well as keeping on with the Losartan . I also take a quarter of an aspirin a day. I am an Padi advanced open water diver aged 56 with over 150 dives and am an enriched air diver last dived in March this year and all was fine and have never had any problems when diving. Strewth, it's like a ward round in ITU this month. Some pretty sick divers out there. Sorry mate but the answer is no you cannot dive at the moment. You need to have conclusive proof you have not got active angina. An exercise ECG, or even an angiogram is what you need to definately rule out the problem. But with a relative who has had cardiac problems so recently, the pendulum swings against you. So whilst this shadow of not knowing hangs over your head, you must not dive at all. If they give you the all clear though, then after a check for the high blood pressure, you may be fine. However if angina is diagnosed and all they say is keep up with the GTN spray when you need it, then you still can't dive. Here your only option is to get bypass surgery or angioplasty, which can effect a cure, and then after assessment you may be passed as fit to dive. 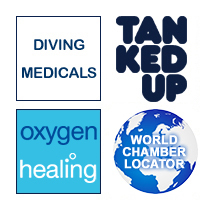 I am planning to book a diving medical with your practice and was wondering if you could advise me as to which medical I would need. I am planning to complete my open water course in the near future. The reason for my concern is that I was stabbed in the chest in 1992. I am now 32 years of age. Although my lung was not punctured the intercostal membrane was pierced. I had several intercostal drains as a result but have since recovered totally. I am active and fit doing regular exercise three to four times a week and have recently done a Snuba dive ( aqualungs float on the surface whilst you dive below ) with no ill effects. Could you advise me so that I can may book the relevant medical with you? I'm a paraplegic who qualified as an advanced open water diver last year. I had a medical done by my GP prior to diving; can you tell me how long the medical is valid? It was a PADI medical. On the PADI medical, unlike the BSAC one there’s no box for an expiry date. So unless your doctor actually wrote “valid to…” then it will last a lifetime. However with your paraplegia it would be an idea to get yourself revued by a dive doc regularly.